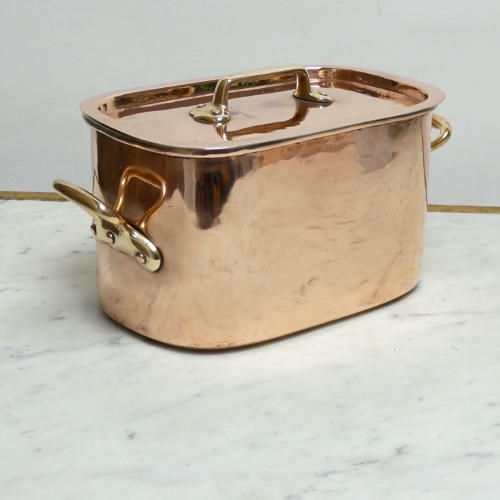 A small, French copper fish kettle, or casserole, with lid and drainer. This piece is rectangular in shape, with rounded corners.It could be used for cooking fish, or a small joint of meat, and the drainer makes it easy to remove the fish or meat from the pan. It is well made, from quite a heavy gauge of copper, and it has castellated seams around the base and up the side. It has ornate brass handles to both sides and also to the lid, and it dates from c.1880. Both the pan and lid are marked with a number '26' which relates to the internal length of the pan. It is in very good condition and the interior has been re-tinned so that it can be used.